Teresa Weatherall Neal was happy to highlight a raft of community supporters at her State of Our Schools address, from the Steelcase Foundation to Grand Valley State University. But the superintendent didn’t expect to get an up-close-and-personal thumbs-up from her most crucial support base for Grand Rapids Public Schools: a parent. Summer Wright approached Neal after her May 4 address to tell her that, while visiting relatives here from North Carolina, she planted stakes in Grand Rapids because of GRPS. “I saw what Grand Rapids Public was doing, and decided I needed to stay here for my kids,” said Wright, with children Quinn and Torin Hodgman by her side. Students at Coit Creative Arts Academy and Public Museum School, respectively, they enthusiastically endorsed their mom’s view that the schools are “very innovative, very hands-on and connected to the community.” Fourth-grader Quinn’s praise was so effusive that he got a warm hug from the superintendent. They were perhaps the most vivid example of the gains Neal touted in her annual address, as well as her ambitious plans for more innovation ahead – including a newly announced, $17 million remake of Ottawa Hills High School as a career/technical center. 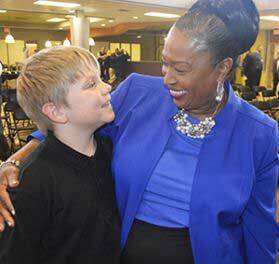 Buoyed by last week’s passage of the Kent ISD-wide enhancement millage, Neal challenged her audience to continue the course she has led since taking office five years ago and launching a districtwide Transformation Plan. Her sixth annual address traced the district’s upward trajectory from the “almost dark” period before she came in 2012, marred by budget cuts, school closures, internal divisions and waning community support. But she said the district and community “united behind common goals” to stop the “churn” of instability and raise student performance. The Transformation Plan’s “bold and comprehensive” vision backed by community support, as evidenced by a $175 million bond approval in 2015, has produced major results, Neal said. Among them: the opening of the Museum School and the C.A. Frost Middle High School; expansion of the Challenge Scholars program awarding fully paid tuition at Grand Rapids Community College to Union High School graduates; and a planned $20 million Spanish-English immersion high school as part of the multi-faceted Plaza Roosevelt development. Neal also hailed the district’s first enrollment increase in two decades, rising graduation rates and test scores and more students taking college dual enrollment classes. She lauded the fact six GRPS schools were taken off the state’s list of lowest-performing Priority Schools, and two schools added as Reward Schools for making dramatic gains. And she gave shout-outs to joint city-school programs that connect children with nature, achievements of GRPS athletic teams and the rebirth of district arts programs. 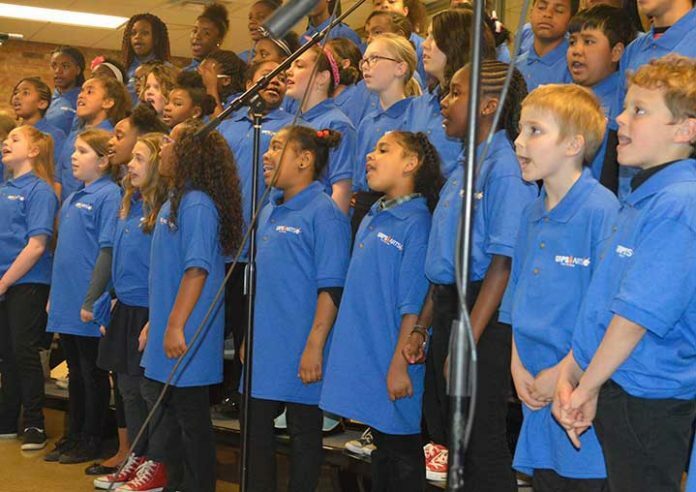 Those include the 1,830-piece Citywide Art Show this month at Western Michigan University’s downtown campus and a dramatic increase in choral competitions. But she warned against complacency, saying GRPS needs to “work harder, outpace, and do better than every other district” to fully achieve its aims. Community partners are crucial to that effort, she said, noting several foundations have contributed to a $14.5 million capital campaign for construction projects. She rolled out several new initiatives with broad community backing. A key piece is a focus on academics, from third-grade reading to college and career readiness. Grand Valley State University is launching a three-year literacy intervention initiative that will feature lab classrooms in three West Side schools. The Steelcase Foundation is supporting an effort to improve math and science scores at Stocking School, and an “early warning system” to catch students before they fall behind. As a major new investment of energy and funds, Neal singled out Ottawa Hills High School, which has struggled with enrollment and graduation rates. The district is pouring $17 million into the building to renovate and reinvent it as a career and technical center. In addition, next fall OHHS will host the district’s first Early Middle College program, where students can graduate in five years with both a high school diploma and an associate degree from Grand Rapids Community College. Neal has been an effective cheerleader for the whole school system, drawing donors to her side, said Diana Sieger, president of the Grand Rapids Community Foundation, which backs the Challenge Scholars program. Sieger said foundation leaders see strong schools as crucial to a thriving Grand Rapids, and are eager to help Neal lead the transformation.